It’s not long ago since I read a Facebook post by Dale Partridge. It was the first time I heard about him, but since then I follow him constantly. His blog is a huge resource of inspiration. Being intrigued by his person and what he promotes I read the book he wrote “People over profit” and here is my review. The main point of the book is that it tries to redefine the current understanding of capitalism and how people do business. It goes back to the root and explains how great entrepreneurs made a difference by valuing people and what we can learn from them. The book is divided in three parts as follows. In this first part the author identifies a cycle the companies are stuck for centuries. He calls it “a pattern of corporate behavior”. 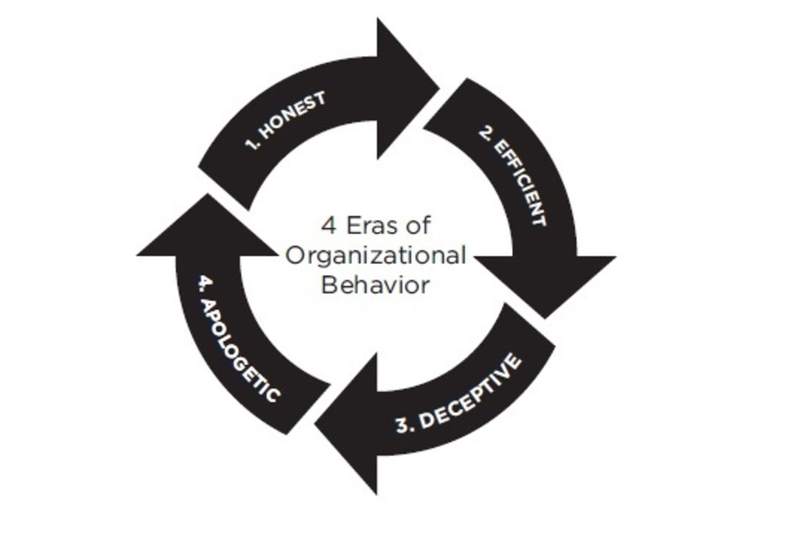 Every business starts with honesty, then looks for efficiency but that comes with a cost that brings deception. Then trying to go back to the values they started with. This creates a cycle from a period where the people where valued over profit, to a period where profit is valued over people, and then going back again. This whole cycle is affecting the company but also the marketplace. This part of the book goes into depth for each era and gives real life examples about companies going through these phases. In this part he shares seven core beliefs that are shared by almost all the successful leaders and organisations and what it takes to break the cycle. “What motivated them to remain ruthlessly committed to their vision and seemingly impervious to compromise?” is the question that the author is addressing. The seven core beliefs are written bellow and are explained with examples in the whole second part of the book. This part of the book shows why is important to keep all of the core beliefs, not just some of them, and how to break the system. At the beginning of this part the author states: “It’s actually possible to create a world where the Honest Era is no longer an era, but rather just the way things are.” and through the whole remaining of the book tell his advices how to really do that. Even you are not a business man and you do not own a company, like me otherwise, “People over profit” is a good book to read. It is not just a book that you can apply it in professional life but also in your personal life. We need people who are committed to telling the truth, who value people and are impacting the world in a positive way. “The net effect is that you’ll end up living with purpose, become even more successful, and achieve good that will outlive you.” as Dale perfectly said. If you already read it let me know in the comment section bellow your impression about it or the author, if not I strongly recommend it. Here is an additional bonus, a TED talk that Dale Partridge gave about his book.